A 2GO Travel passenger vessel bound for Cebu from Manila was stuck at sea from engine troubles off Lauis Ledge, Tuesday Morning, April 9. The M/V Saint Pope John Paul II vessel was brought to Pier 6 in Cebu City at 1:48 p.m.
Based on the initial report, the vessel's 1,952 passengers were safe. In a video shared by one of the passengers of the ship (who asked not to be named), travelers can be heard screaming for water and food. According to him, passengers went “rowdy” after they heard an explosion coming from the engine of the vessel. “Ang gi-announce nila ganiha pagkaputol sa power kay change power ra but kita kog fire crews panaog,” he said. Electricity was completely shut off. Passengers on board complained that they could no longer utilize the water supply and cooking appliances. They also braced the heat as all air conditioning units and electric fans could not be used. Liuetenant Junior Grade Mike Encina, the spokesperson of the Philippine Coast Guard (PCG)-Central Visayas, said the vessel left Manila around 11 p.m. on Saturday, April 8. 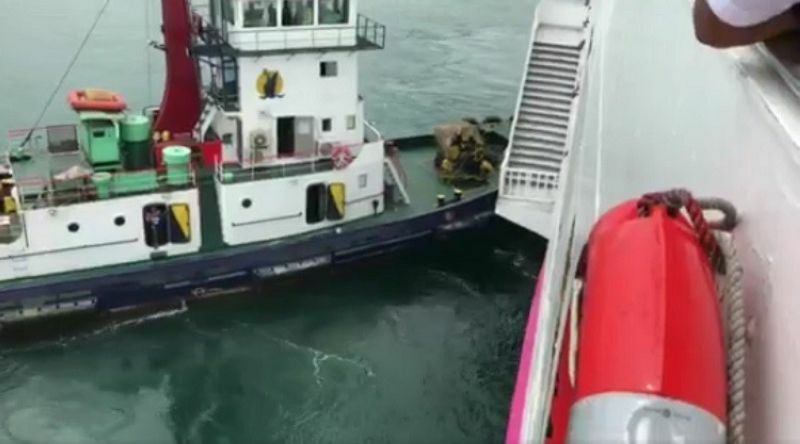 Around 9 a.m. Tuesday, the vessel experienced engine troubles that made the captain decide to halt the vessel at sea, to not vitiate the engine. Three tugboats (Jollo, NHTC II, Genera I) by the PCG-Central Visayas, pulled the vessel to Pier 6. Encina said that even when the ship had a power outage, there were no health and untoward incidents reported. 2Go Travel has yet to release a statement on the incident.